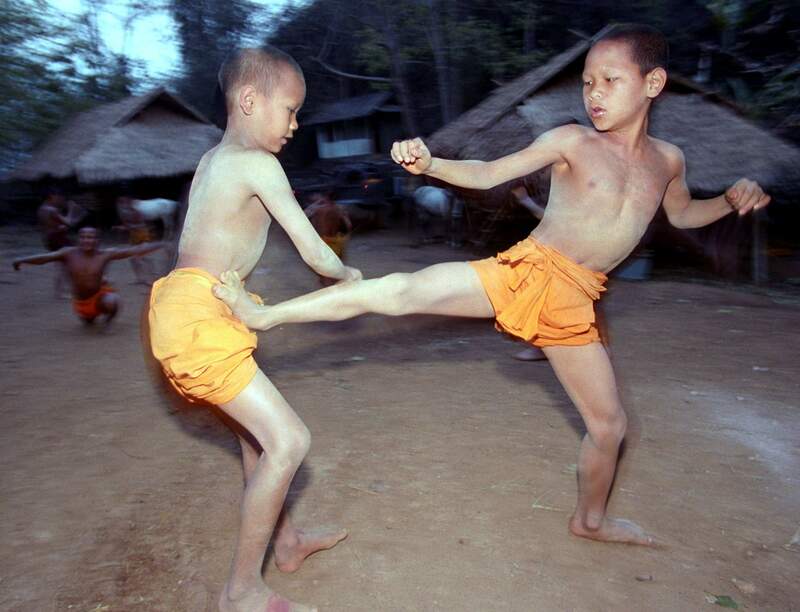 Two novice Buddhist monks practice Muay Thai (Thai kickboxing) during a 2002 morning training session at the Golden Horse Monastery in northern Thailand. The death of a 13-year-old boy who was knocked out during a Muay Thai boxing match in Thailand has sparked debate over whether to ban child boxing. BANGKOK – The death of a 13-year-old boy who was knocked out during a kickboxing match in Thailand has sparked debate over whether to ban matches involving children. The death of Anucha Tasako came after a Muay Thai – Thai boxing – match Saturday in the Bangkok suburb of Samut Prakarn. The Facebook page Muaythai Krobwongjorn, which covers the sport, said he died from a brain hemorrhage. Protective gear is normally not worn in the sport, and video circulated on social media said to be of the fight shows Anucha not wearing any. Child boxing is widespread in Thailand, especially in rural areas, where it offers a way for children to help provide for their families and a path to lift them out of poverty, according to its advocates. Opponents say the sport is dangerous, citing studies such as one published last month by Thailand’s Mahidol University saying that allowing children under 15 to box could result in various types of brain damage. Public television station ThaiPBS reported that Anucha had fought more than 170 matches since he began boxing at the age of 8, and was currently fighting in the under 90 pound weight division. It said he was raised by his uncle, who is a boxing trainer, after his parents separated. The uncle, Damrong Tasako, told Thai PBS that Anucha’s death was an accident but he would like to see regulations for children under 15 to wear protective gear to soften blows to the head and body.